(e.g., chance, probability, sampling distributions, confidence intervals, etc.)? (e.g., reading and interpreting tables and graphs that use rates and percentages)? 5. What best describes your highest level of schooling completed? 6. What best describes your fluency in English? 7. How many undergraduate statistics courses have you completed? For the following questions select the one answer you think best. Select “DON’T KNOW” if any other answer would be just a guess. Assume that all these statements apply just to the subjects in these charts. Do you think the following statements accurately describe the data shown in this pie chart? 9. 20% of smokers are Catholics. 10. 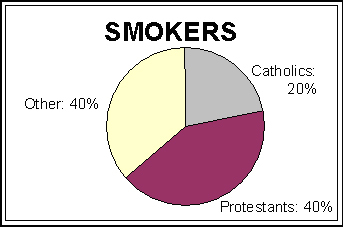 Protestants (40%) are twice as likely to be smokers as are Catholics (20%). Do you think the following statement accurately describes the data shown in this bar chart? 11. 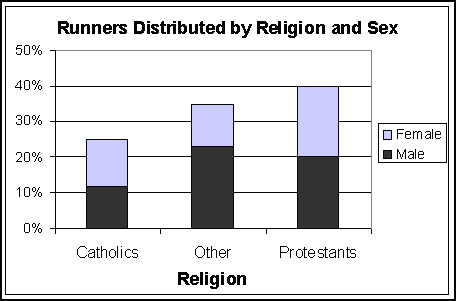 20% of Protestant males are runners. Select the one answer you think best. Assume that all these statements apply just to the subjects in this scatter plot. Do you think the following statements are accurate interpretations of the scatter graph shown above? 12. 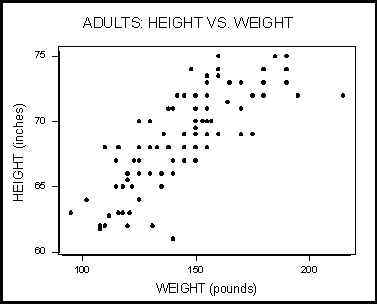 Adults who weigh more tend to be taller (than those who weigh less). 13. The more an adult weighs, the taller they tend to be. 14. (Typically) as weight increases, height increases. 15. As adults' weights increase, their heights tend to increase. 16. As an adult's weight increases, their height tends to increase. 17. An adult who weighs more will tend to be taller. 18. As an adult weighs more the taller they will tend to be. 19. If an adult increases their weight, they can expect to increase their height. 20. If weight increases, height will tend to increase. Assume that all these statements apply just to the subjects in this chart. 21. 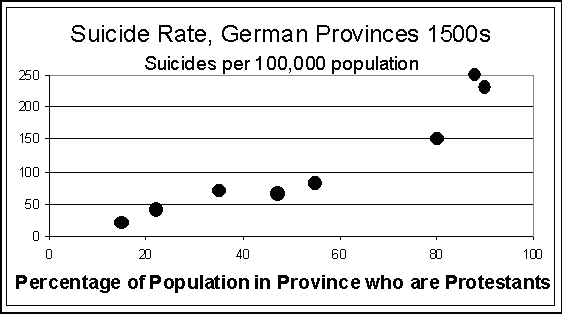 As the percentage of Protestants increases, the rate of suicides tends to increase. 22. Protestants are more likely to commit suicide than non-Protestants (are). Circle the one answer you think best. Circle “DON’T KNOW” if any other answer would be just a guess. Assume that all these statements apply just to the subjects in this table. Do you think the following statements accurately describe the 25% circled above? 23. 25% of females are blacks. 24. 25% of blacks are females. 25. 25% is the percentage of blacks among females. 26. 25% is the percentage who are females among blacks. Do you think these statements below accurately compare the 25% circled with the 50% immediately below it? 27. Whites are two times as likely to be female than are blacks. 28. Females are two times as likely to be white as to be black. 29. Whites are two times more likely to be female than are blacks. Do you think the following statements accurately describe the 20% circled above? 30. 20% of runners are female smokers. 31. 20% of females are runners who smoke. 32. 20% of female smokers are runners. 33. 20% of smokers are females who run. 34. Among female smokers, 20% is the percentage of runners. 35. Among females, 20% is the percentage of smokers who are runners. Do you think these statements accurately compare the circled 20% with the 10% immediately below it? 36. The percentage of runners is twice as much among female smokers as among male smokers. 37. The percentage of smokers who run is twice as much among females as among males. 38. Among these smokers, males are twice as likely to be runners as are females. Select only one of the answers to each question. Two statements “MEAN THE SAME THING” if one can always be substituted for the other. 39. In your opinion, do these two statements mean the same thing? Twenty percent (20%) of high-school dropouts are black. Blacks have a 20% chance of dropping out. 40. In your opinion, do these two statements mean the same thing? Studies show that television violence is strongly linked with juvenile delinquency. Studies show that television violence is a cause of juvenile delinquency. 41. Which study gives better evidence that taking zinc will decrease a nurse's risk of a heart attack? In study A, some nurses chose to take supplements containing zinc while others did not. Those nurses who took zinc had 30% fewer heart attacks than those who did not. In study B, half of the nurses were randomly assigned to take zinc; the others got a placebo. Those nurses who received zinc had 10% fewer heart attacks than those who did not. 42. Which study gives better evidence that taking zinc will decrease a nurse's risk of a heart attack? In study A, some nurses chose to take supplements containing zinc while others did not. Those nurses who took zinc had 20% fewer heart attacks than those who did not. In study B, half of the nurses were randomly assigned to take zinc; the others got a placebo. Those nurses who received zinc had 20% fewer heart attacks than those who did not. 43. In 2000, a research hospital had a higher death rate than a rural hospital. Each patient's condition was classified as either "poor" or "fair." Is it possible that in 2000, this research hospital had a lower death rate than this rural hospital for those patients in "poor" condition AND for those patients in "fair" condition? Do you think the following statements accurately describe the 26.2% circled above? 44. In 1990, 26.2% was the percentage of smokers who were black. 45. In 1990, 26.2% of blacks were smokers. 46. In 1990, 26.2% was the percentage of black smokers. 47. In 1990, 26.2% of smokers were black. 48. In 1990, 26.2% was the percentage of blacks who were smokers. Do you think the following statements accurately describe the 6.0 circled above? 49. In the US in 1996, 6% of low-weight births were in California (CA). 50. In the US in 1996, the percentage of California births among low-weight births was 6%. 51. In the US in 1996, 6% of California births were low-weight. Do you think this statement accurately compares the 6.0% in California(CA) with 9.3% in Alabama(AL)? 52. 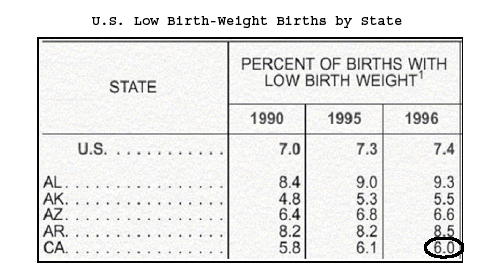 In the US in 1996, there were more low weight births in Alabama (AL) than in California (CA). Do you think the following statements accurately describe the 10.0% circled above? 53. 10% of these women who received an HIV test were 40-44. 54. 10% of these women 40 to 44 received an HIV test. 55. Among those women who received an HIV test, the percentage of those 40-44 was 10%. 56. Among these women 40-44, the percentage who received an HIV test was 10%. Do you think the following statements accurately compare the 10% and the 20% circled above? 57. Women 40-44 were twice as likely to have an HIV test as were women 20-24. 58. HIV tests were twice as likely to be administered to women 20-24 as to women 40-44. 59. 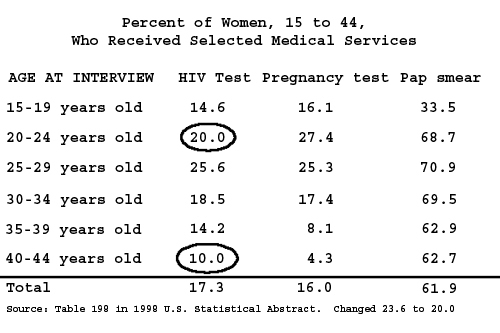 Women 20-24 were two times more likely to have an HIV test than were women 40-44. Do you think the following statements accurately describe the 16.1 circled above? 60. In 1995, the death rate due to motor vehicle accidents was 16.1 per 100,000 Alaskans. 61. In 1995, for those in motor vehicle accidents, the death rate was 16.1 per 100,000 Alaskans. 62. In 1995, the rate of motor vehicle accidents was 16.1 per 100,000 Alaskans. 63. In 1995 for Alaskans who were in motor vehicle accidents, the death rate was 16.1 per 100,000. 64. This survey was much more difficult than I thought it would be. 65. This survey was much more subtle than I thought it would be. 66. This survey was unnecessarily tricky. 67. I felt considerable discomfort in taking part or all of this survey. 68. These tables and graphs are the kind I need and/or want to be able to read or understand. 69. College students should be able to read these kinds of tables and graphs. 70. What is your primary professional association? No affiliation with any quantitative professional association. IASE: International Association of Statistical Educators. NCTM: National Council of Teachers of Mathematics. MAA: Mathematics Association of America. AMATYC: American Mathematical Association of Two Year Colleges. 71. Please identify your primary major in college. 72. What country are you based in? 73. Please comment on anything related to your taking of this survey. End of Survey. Thank you! © W. M. Keck Statistical Literacy Project. 2002. All rights reserved.